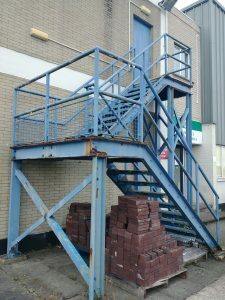 The importance of keeping the external fire escape routes available! As a business owner or site manager, you are responsible to ensure all the fire exits are free from obstacles, covered by emergency lighting and are big enough to ensure all the occupants can safely leave the premises. This does not stop at the last exit from the building! Cars parked at the final exits, poor lighting at the assembly point or a lack of coordination are just a few important fire safety aspects you need to account for. Also, consider the external fire escape staircases which lead from the upper floors of your building. These need to be in a good state of repair and checked monthly to ensure they can do the job! Check for rust, damage from vehicles and prevent storage underneath! These staircases need emergency lighting and signage to prevent vehicles parking at the bottom. Don’t forget the weather so have salt placed on the treads and turns to ensure the evacuation doesn’t come to a slippery end! Encourage the staff to use the external fire escape routes during evacuation drills as good practice and if for whatever reason the stair is not available – then review the building fire risk assessment! It may be obvious, but the sooner the staff leave the building, the safer they are. This is particularly important to staff who exit onto an external staircase. They are now actually safer than if they travelled internally down the stairs and through the building as the travel distance is shorter by leaving at the staircase outside. If there are members of the public who may need to use the external fire escape route, you need to consider the addition of fire safety and directional signage. This will assist them in the correct direction of travel and also ensure the flow of people is continuous. Members of the public who are not directed by staff are unlikely to use the external fire escape route, so consider this when planning an evacuation or emergency fire action procedures.